Carefree Emulsion by Johnson Diversey is formulated to give a long lasting high gloss finish. Use a clean mop or polish applicator to apply the liquid. Dilution: Apply the product neat and allow to dry thoroughly before applying a second coat. Sweep and damp mop floors on a daily basis. Easy to apply using a clean mop or polish applicator. Complete pack will cover up to 400m² of flooring. Q: Can you please advise which product to use to maintain a floor which has been recently polished with Carefree Emulsion? A: It would be fine to use a standard Carefree Maintainer on a floor which has been recently polished with the Emulsion, which can be found on our website. Q: What would you recommend as the best way to apply this polish to the floor. A: We sell a floor polish applicator which we would recommend to apply the polish to the floor as it is simply to use and very easy. Q: I'm looking for a floor polish to use on my hall floor, it is a sealed wood sprung floor, would this polish be suitable? The floor gets a lot of usage, examples being; badminton, children, dogs, etc. A: We have spoken to our supplier who advise us that this is a hard wearing polish and would therefore be fine to use on your hall flooring. 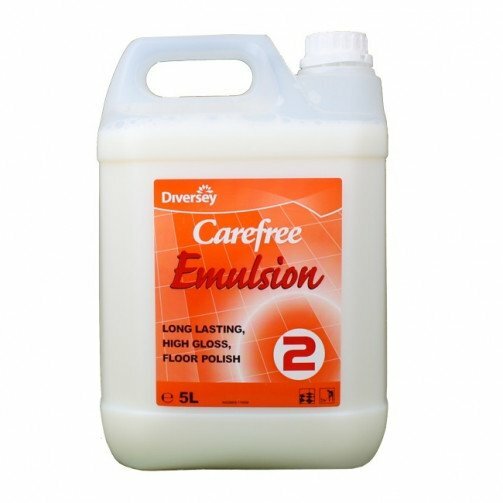 Because of the heavy traffic on this floor they also advise the use of Carefree Maintainer on a regular basis- this will save the need for stripping and repolishing quite as often. Q. Is thiss suitable for polished solid wooden floors? A. Could you please confirm what polish is on the floor, plus what type of wooden floor you have.